Most books I can recommend for some aspect of their writing - even if the whole ensemble falls short. 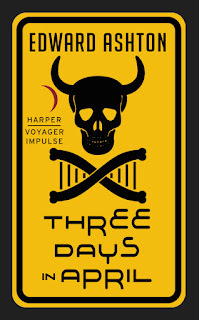 Sadly, Three Days in April is one I can't recommend at all. But let's rewind a little. 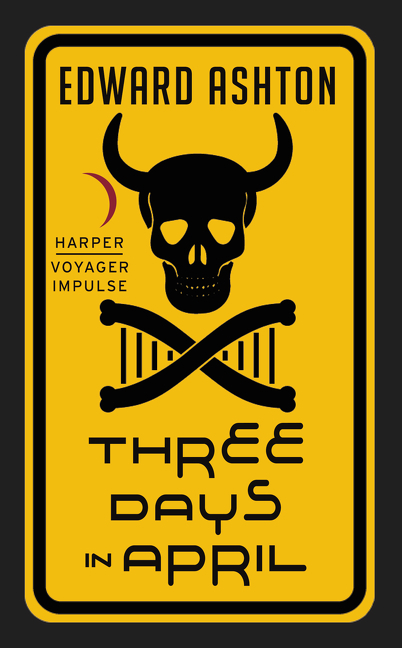 Three Days in April is a fast-paced technological thriller set in a future Baltimore where government surveillance is everywhere (and they have a network of orbital kinetic energy weapons for when they stop merely watching), and a significant proportion of the populace are genetically modified, most along fairly standard models (the Pretties, for instance, or the Neanderthals). The trouble starts when a plague runs through Hagerstown - and the government quickly starts wiping the public newsfeed of the disaster. Anders, a mouse-DNA'd-teaching-assistant is caught in the middle of the coverup, along with irritating hacker roommate Gary, and new-acquaintance-and-Neanderthal Terry, when Terry's sister is discovered to be trapped within the killzone. Then... things get weird. It doesn't sound like a terrible premise, but the problem is in the execution. The plot, simply put, doesn't work. It's fast-paced, yes, but few of its developments are explained, nor do they have any meaningful foreshadowing, making the resolution seem like deus ex machina to an absurd degree. There are some interesting links, but unless I'm missing a great deal of the novel, it utterly fails to satisfy in this respect: it's a rollercoaster of meaningless twists. I was left wondering where the last twenty percent of the novel was. Our heroes were saved? How? What about the technology? The genetic engineering and subsequent social tension doesn't go beyond the obvious, either (with the exception of the Neanderthals, who seemed an interesting resurrection, but were rarely dealt with) - the normals hate the engineered, etc. Expect no detailed studies here. No spoilers for the main plot, but the technology it deals with is... interesting enough, for the most part, but fails to carry the novel. The resolution reads more as magic than technology, and could be accepted far more easily as the former with the tiny amount of exposition provided. I dislike writing wholly negative reviews, but I cannot in all conscience recommend this book for any aspect of its writing. It's a technological thriller that fails to thrill with technology, character, or plot. It fails to explain what it should, and overexplains when it doesn't need to. Its characters fail to grow beyond stereotypes, and occasionally sexist ones at that. If you're looking for a fast-paced read, try something else from the archives - maybe Rivers of London, if you're into UF, or The Jennifer Morgue, for Stross with a more humourous bent - but not this.